Cosmetic Cupcake: A lovely package from Aysh! A few weeks back I received a wonderful email from the gorgeous and very lovely Aysh who blogs over at Truly Madly Deeply. Aysh blogs about beauty, nails, fashion and also about lifestyle stuff which I love to read! I also love her British ramblings and sayings - like "chin wag" and "bits n bobs" =p She VERY generously offered to send me her extra bottle of GOSH Holographic as she knew I desperately wanted it. I was absolutely floored by her generosity!! I am constantly amazed at the kindness of others in the beauty blogging community =) Of course I couldn't thank her enough and took up her once in a lifetime offer!! 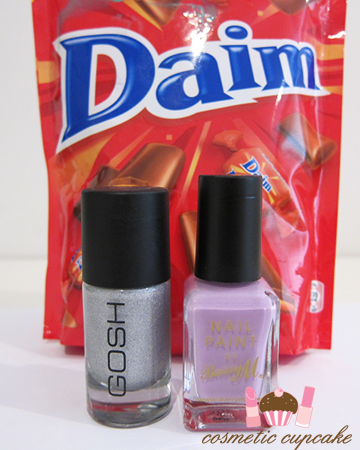 Not only did Aysh send me a bottle of the wonderful GOSH Holographic but she also included some Barry M polishes that were also on my wishlist and a packet of one of my favourite choccies Daim!! *jumps up and down in excitement* I must read like an open book because all you wonderful ladies know my tastes and likes down to a t somehow lol. The very awesome GOSH Holographic (!!!!!!) and Barry M Berry Icecream. 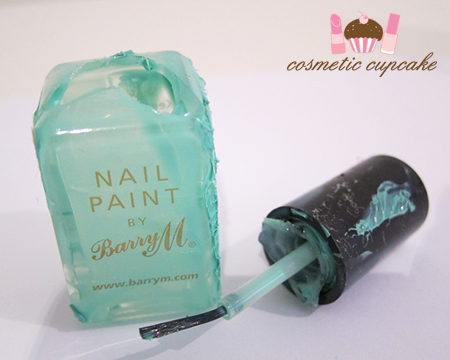 Unfortunately the bottle of Barry M Mint Green Aysh sent didn't make it though =( As you can see below the whole top of the bottle broke clean!! It was such a gorgeous green too ARGH. The GOSH bottle was cracked a little too but the glass is so thick it didn't do much damage phew. Damn mail people! The polish leaked everywhere in the package but thank goodness for remover! The bottles looked like brand new after I was finished with them hehe. Too bad about the broken bottle =( It was so pretty! @Mez: It's soooooooo pretty! It really reminds me of berry icecream! @communicatingbeauty: My heart sunk when I smelt nail polish before opening the package =( But the other 2 polishes and sweets DEFINITELY made up for it!! @Aysh: I can't thank you enough hun! I've already gorged on the choccies x) I'm waiting for sunlight!!! What a nice little package. 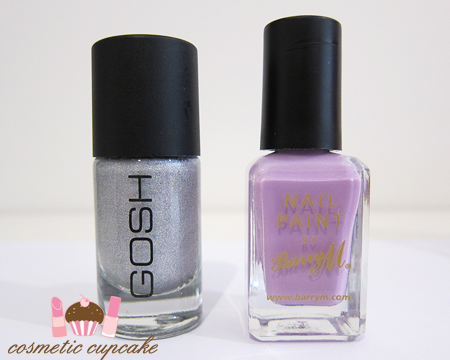 That lilac Barry M is so pretty. It's such a shame about the broken bottle though. @Jackie S: They are really pretty aren't they?!!! Especially the GOSH! @Danielle: It's a gorgeous lilac isn't it? Barry M does such pretty colours!